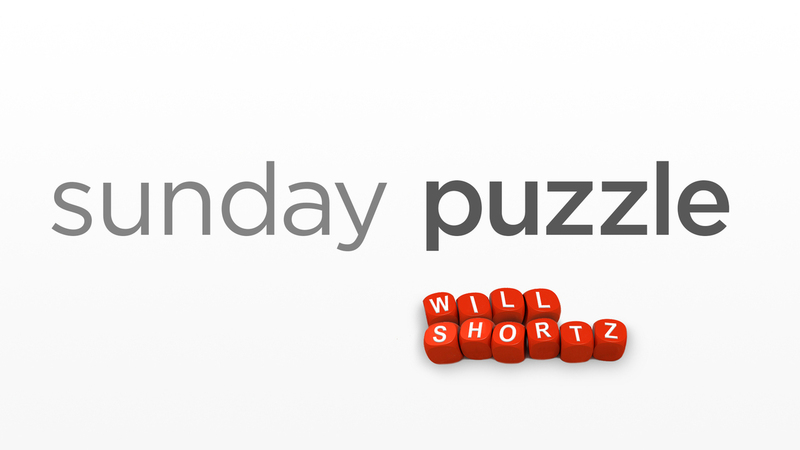 Sunday Puzzle: Stuck In The Middle NPR's Lulu Garcia-Navarro and puzzlemaster Will Shortz play this week's puzzle with William Zweck of Gilbert, Ariz.
On-air challenge: Every answer is a three-syllable word or name in which the middle syllable is accented and pronounced "sigh." Last week's challenge: This challenge comes from listener Stuart Portnoy of Arlington, Va. Name a famous actor — first and last names. The last name is a well-known brand. Drop the last letter of the first name and you'll get the kind of product it's a brand of. Who is it? Winner: William Zweck of Gilbert, Ariz.
Next week's challenge: In English, a short "u" sound is usually spelled with a "u," as in "fun" and "luck." Occasionally it's spelled with an "o," as in "come" and "love." Can you name two everyday one-syllable words in which a short "u" sound is spelled with an "a"? If you know the answer to next week's challenge, submit it here. Listeners who submit correct answers win a chance to play the on-air puzzle. Important: Include a phone number where we can reach you Thursday, Feb. 8 at 3 p.m. ET.